This soft spring editorial captured by CHRISTINE PIENAAR was designed to capture the fleeting beauty of spring through an intimate wedding at LAKEWOLD GARDENS, a beautiful historic home and European-inspired garden built over 100 years ago. Seattle wedding planner CALLISTA & CO. and Seattle wedding florist GATHER DESIGN COMPANY worked together to create a design with a romantic old world feel. The table was set with neutral linens from to create a soft canvas for the vintage flatware and stemware from FANCIFUL RENTALS, and the detailed chargers and plates from CORT PARTY RENTAL. Overflowing arrangements of the best flowers spring has to offer filled the middle of the long tables: ranunculus, dogwood, spirea, fritillaria, hellebores, daffodils, pieris, hyacinth, and roses. The colour palette of cream, pale yellow, soft greens, mauve, dusty blush, and soft peach brought both warmth, softness, and strength to the design, with both full, fluffy blooms and architectural blooming branches. The boudoir photos taken in front of hand painted wallpaper set the stage for the delicate beauty of the day to come. The bride was dressed in a custom gown by STESHA HO, with a bodice and sleeves appliquéd with lace and a flowing skirt, and soft pink Prada heels. 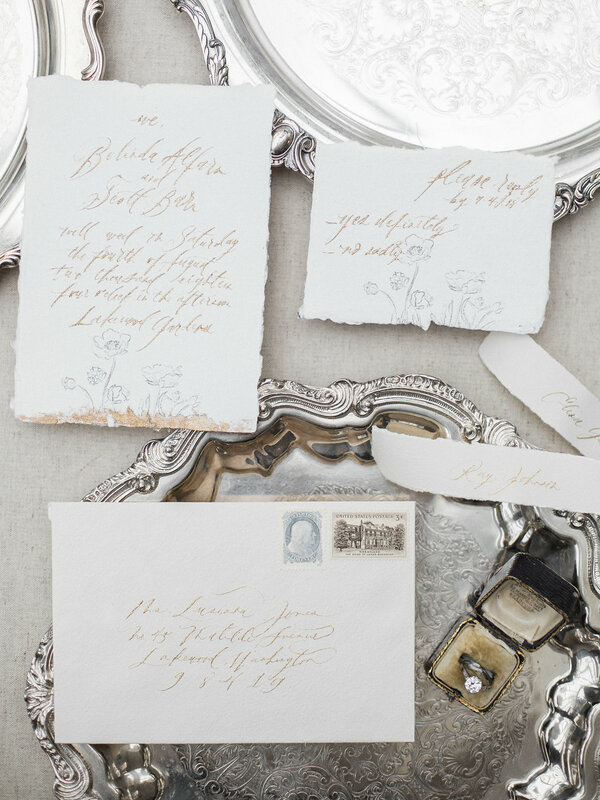 Hand calligraphed paper goods by HELLO MAURELLE, a vintage ring from ASHLEY ZHANG JEWELRY and a headpiece by bridal accessories designer ALL ABOUT ROMANCE rounded out the details. So many beautiful ideas to take away from this shoot for your wedding day! Seattle wedding florist GATHER DESIGN CO. is a valued member of the Magnolia Rouge Vendor Guide. They approach wedding flowers as an artful medium to tell your love story. Your flowers will be beautiful, seasonal, and fresh, but more importantly, they will mirror the graceful way your gown flows, or the organic movement of the long grass surrounding your ceremony site. Their designs are at once ethereal and timeless, organic and architectural, and are always created with the intention of telling your story. Seattle wedding planner CALLISTA & CO. offers personalised planning and design services for beautiful weddings and events around the world. With meticulous and organised coordination, warm and attentive support, as well as custom and creative design guidance, they create stress-free events that showcase your unique vision. You can see more of their work in our Vendor Guide and if you're a bride looking for a Seattle wedding planner make sure you check them out. You should also check out this Modern Spring wedding inspiration honouring the Magnolia Bloom by these two Seattle wedding vendors. Bridal accessories designer ALL ABOUT ROMANCE is a small design studio based in Australia with a passion for creating exquisite and delicate artworks. From couture wedding veils to bridal adornments and accessories that will be treasured by brides for years to come. "Our designs are inspired by nature with a decidedly feminine flair for the modern bride who is romantic at heart. We meticulously construct our pieces using the finest materials sourced from UK and Europe with an obsession for handcrafting in the traditional way." ALL ABOUT ROMANCE are a valued member of our vendor guide and you can see her 2018 collection here.